For any researcher needing to save days pouring through individual issues of the Musings or for anyone who just loves local history, this index is a must. If you are looking for Hideout School, or information on Hawkins Mill or even how Pettigrew was named, this is the book that you need. Dorothy Dyer of the Society staff, has painstakingly spent hours pouring through each issue of The Madison County Musing and compiled this list of all topics occurring the magazine for the past 21 years. The issue, volume and page numbers for each topic are listed and all topics are listed in alphabetical order. We are in the processing of adding this index to this website, but with nearly 100 pages of material, it will take some time. Those articles that begin with numerics, the letter A and the letter B have been added to this site and may be viewed by clicking on the words Table of Contents at the top of this block or choosing the letter you want from the bottom of the side menu on the right of this page. To purchase this book, you may click on the button above and you will be connected to Pay Pal where you can use your Pay Pal account or charge your purchase to your Visa or MasterCard. Or, you can send a check in the amount of $18.00 to the society requesting the Madison County Musing Topical Table of Contents Book. 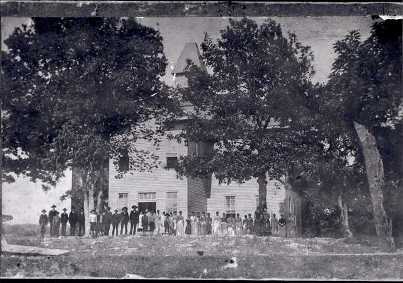 Huntsville School, also known as the Huntsville Academy, stood are the corner of today's College St. and Cain Street, in front of the Huntsville Cemetery. This picture c. 1900. The building would burn in 1913.